Kids at the Beach Subtraction Math Center provides an inviting math center for learners to practice subtraction facts. There are 12 clothespin clip cards and a recording sheet in this packet. There is a subtraction fact and a choice of three differences printed on each clothespin clip card. The cards and recording sheet have beach themed graphics. 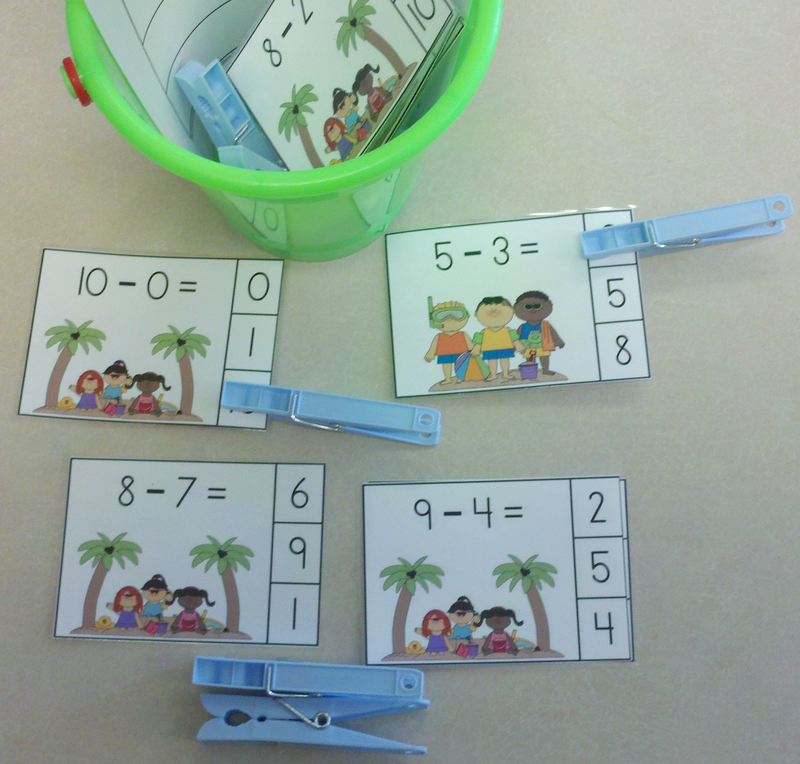 Kids at the Beach Subtraction Math Center works well with summer, beach, ocean, or vacation themes. Print, laminate, and cut out the clothespin clip cards. Print the recording sheet that goes with the Clothespin Clip Cards. You will need 12 clothespins for this center. To keep with the beach theme, you may put the cards and clothespins in a sandpail. Learners clip a clothespin on the correct difference or they can use dry erase markers to circle the correct difference. You may opt to make these cards self-checking by writing the answer on the back or marking a dot on the back at the correct spot. After selecting the correct difference, learners write the equation and difference on the recording sheet. Kids at the Beach Subtraction Math Center helps learners develop subtraction fluency and supports the Math Common Core Standards for Operations and Algebraic Thinking.